Black italian fashion groom suit in pure wool fabric. Peak lapel with contrast fabric piping and single patterned button... Black italian fashion groom suit in pure wool fabric. Peak lapel with contrast fabric piping and single patterned button closure. Flap pockets with contrast trim and angled buttonholes. Single patterned button and angled buttonholes at cuffs. Single vent at back. Jacket with rounded hem at front. Standard size 50 measures 74 cm from neck to hem. Weste mit Schalkragen, schwarz und violett, aus reiner Jacquard-Seide. 3 Steinnuß-Knöpfe und 2 Taschen. Rückfutter mit e... Weste mit Schalkragen, schwarz und violett, aus reiner Jacquard-Seide. 3 Steinnuß-Knöpfe und 2 Taschen. Rückfutter mit elastischen, um die Breite an der Taille einzustellen. 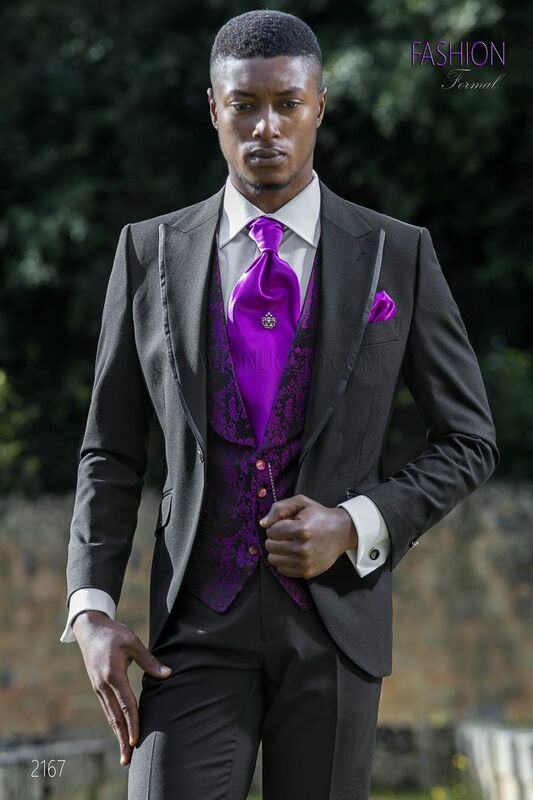 Cravat and handkerchief set made from violet satin. Handmade.